Circular saws (also known as buzz saws for the sound they create when cutting) were first invented towards the end of the 18th century, for use in the timber industry. Its rotary nature allowed logs to be cut more efficiently (as compared to the up-and-down motion involved when sawing logs with a pit saw) and converted into timber at a faster rate. Circular saws typically require more power (via electricity, a gasoline engine or a hydraulic motor) to operate, and can be used to cut through various materials: plastic, metal, masonry, wood, etc. 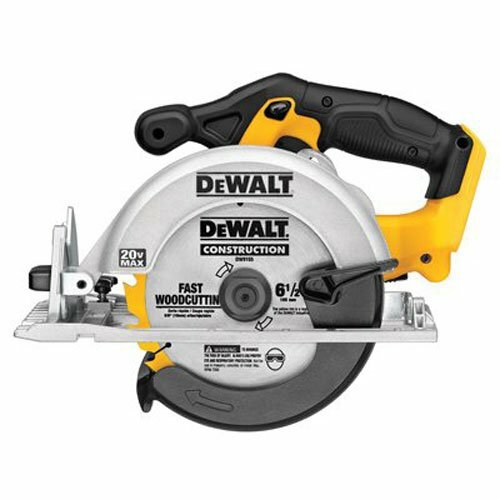 Circular saw blades are usually specialized to cut through a specific material, and may be designed to be mobile (hand-held) or stationary (mounted to a machine). Circular saws are typically designed with a blade guard (which covers the blade when the saw is not in use and retracts to expose the blade when in use), a foot plate or shoe (which steadies the saw against the workpiece), a depth adjustment device (which allows you to work with pieces of varying thicknesses), and a bevel adjustment (which allows the foot plate to tilt in relation to the blade for making bevel cuts). Below we list and review the 5 best circular saws you can currently buy online. 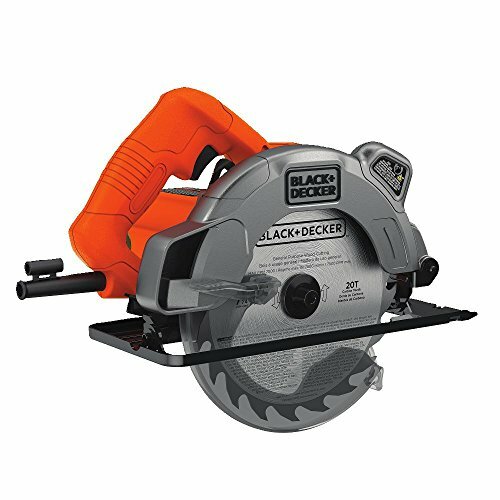 The Black & Decker BDCCS20B is a red, compact and relatively light (6.4 pounds) handheld circular saw that is also very user-friendly. 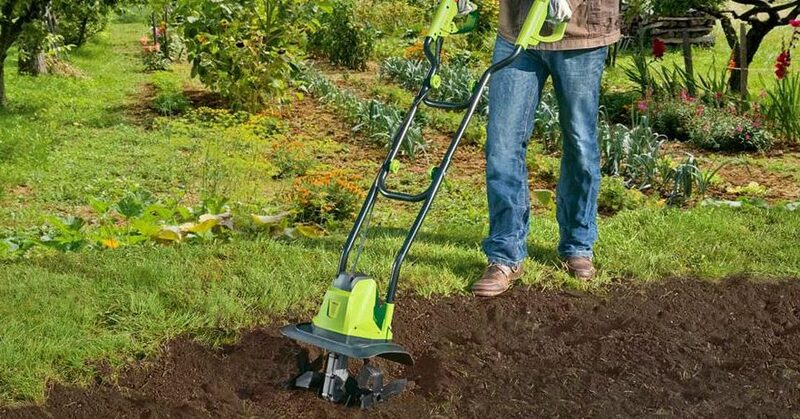 It runs on a 20V lithium-ion battery (the battery and charger are sold separately) and is thus cordless, allowing for easy mobility around your workplace. 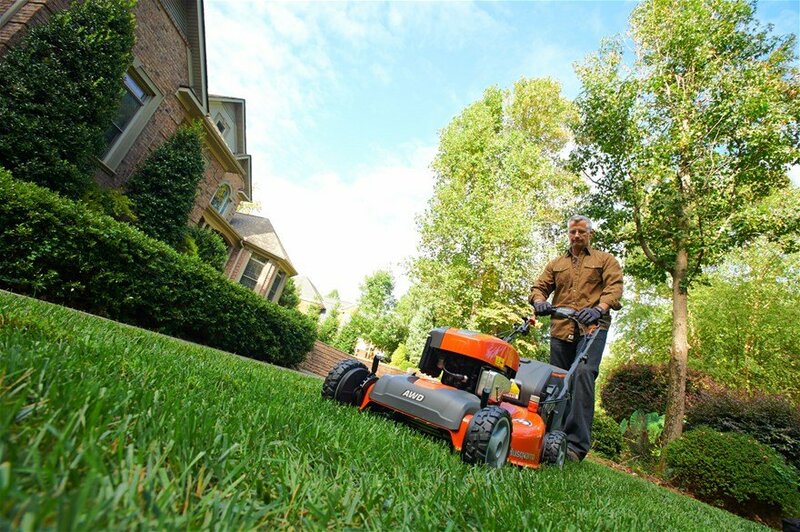 It cuts with a high torque motor 5-1/2-inch fast-cutting blade, which allows for a diverse range of cuts. The tool-free depth of cut also enables you to make easy depth adjustments, with bevel adjustments at 45 and 90 degrees detents. 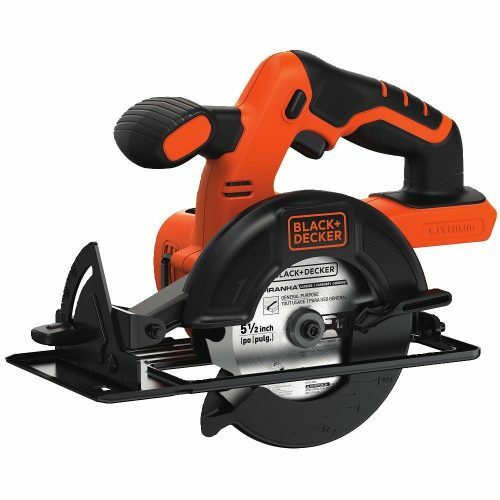 The Black & Decker BDCCS20B comes with a 2-year limited warranty and is ideal for small to medium-size projects. 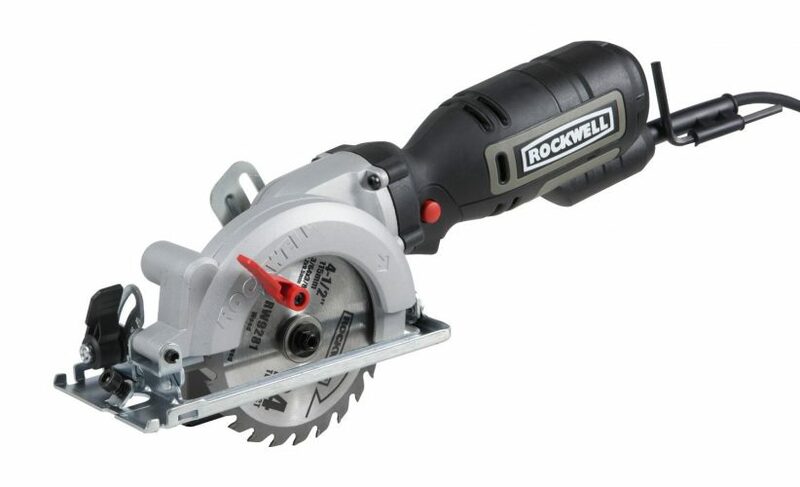 The Rockwell RK3441K has similar dimensions to the Black & Decker BDCCS20B, weighing 6.75 pounds and measuring 6.9 inches x 18.2 inches x 4.2 inches. 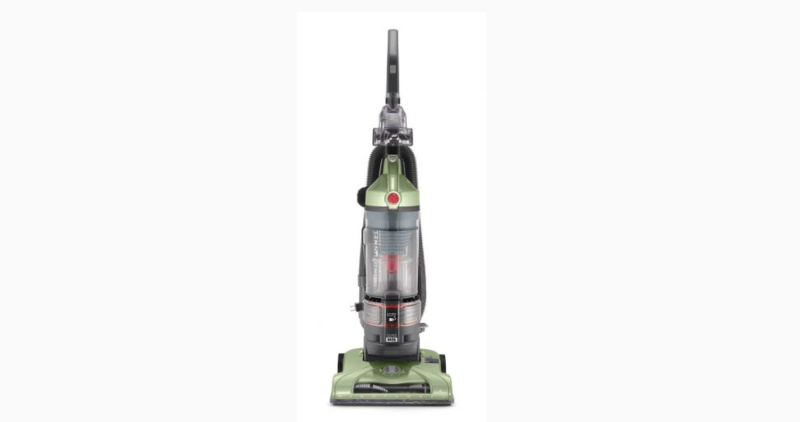 Its compact design and slender, inline grip allow for easy portability, balance, and control, but its higher voltage (120V) accords it greater cutting power (its maximum cutting depth is 1-11/16 in). Its 4-1/2-inch blade can make fast and relatively powerful cuts, while the easy set depth-gauge lever allows you to make easy cutting adjustments (up to 2 inches). The relatively small and thin blade also creates less tool strain, allowing it to match a full-size circular saw’s (7-1/4 inch) cutting speed and power. 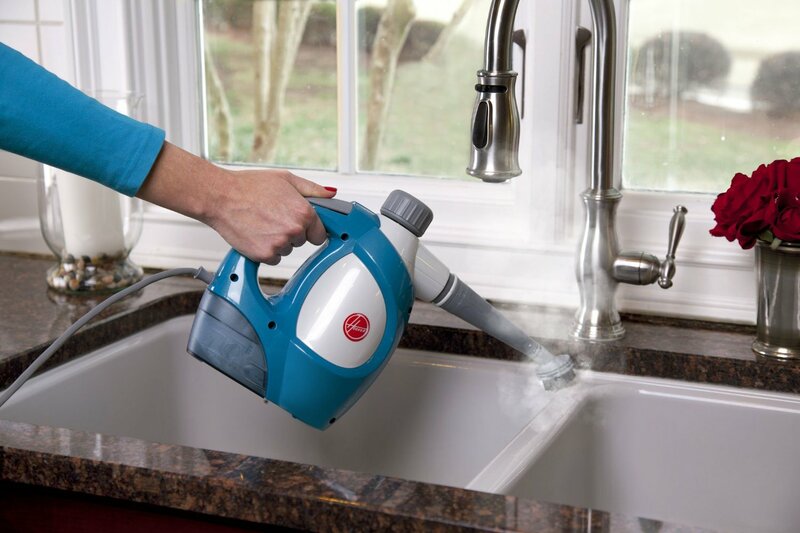 The dust extraction port and 1-1/4 inch vacuum adapter also make the cleaning up process easier, thus helping to keep your workplace clean and tidy. The Rockwell RK3441K comes with a 3-year limited warranty. Like the previous two circular saws, the Rockwell RK3440K VersaCut comes with a compact design: 17.3 x 8.7 x 4.6 inches. 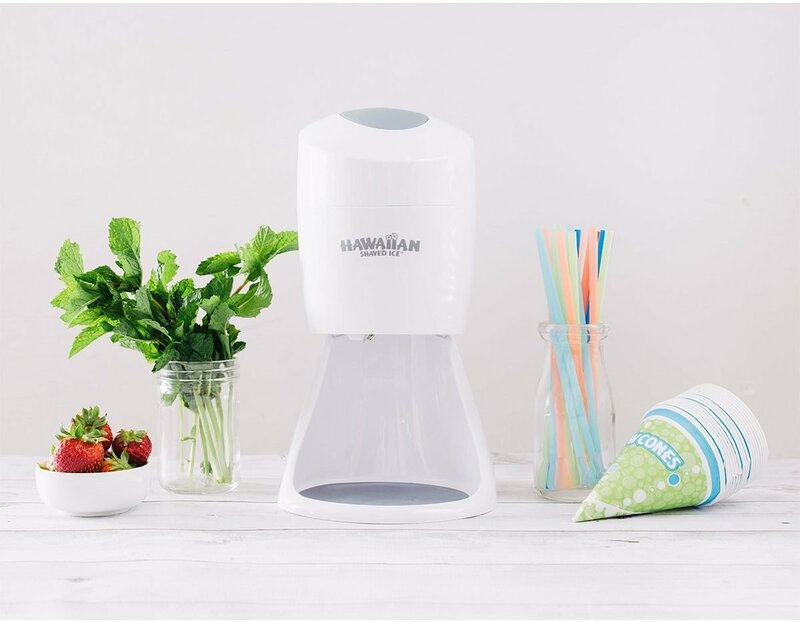 Its streamlined silhouette, lightweight (3.4 pounds) and ergonomically balanced design allows for much better and easier control, as well as comfort for the user. 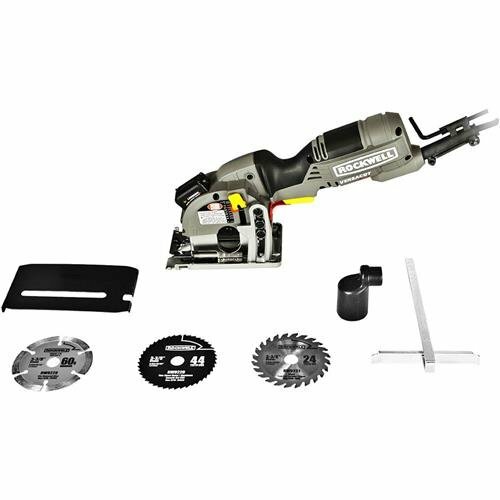 Its sleekness also houses significant power and versatility: the VersaCut comes with three different mini-circular saw blades (with a 3-3/8 inch blade diameter) for cutting wood, metal and tile. You can thus use it to cut a wide variety of material (up to 1-1/16″ thick), e.g. plywood, concrete, laminate, sheet metal, plastics, pipes, hardwood flooring, and tiles. 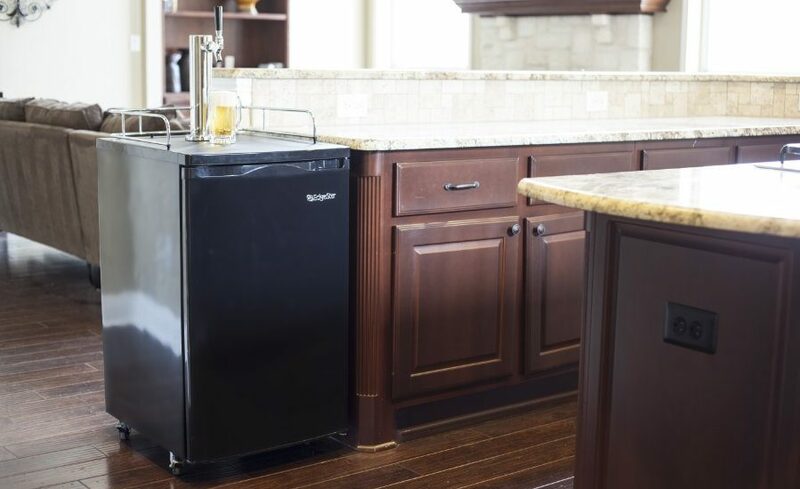 The blades are housed in a rugged, full metal guard for improved durability, and the VersaCut has a lock off switch that prevents accidental starting. The precision laser guide (Laserguide™) helps indicate the cutting path, allowing for improved accuracy and precision. Meanwhile, the easy to set depth indicator helps you make quick and precise depth adjustments. The Rockwell RK3440K VersaCut is also equipped with a dust extraction adapter, which keeps the cut line free from visibility-impairing dust. It also comes with a 2-year limited warranty and is powered by electricity. Weighing 8.45 pounds, the DEWALT DCS391B allows you to make demanding cuts with relative ease via its powerful 460 MWO, 5250 RPM motor. Its 6-1/2″ carbide-tipped blade is housed in a high strength, lightweight yellow magnesium shoe for greater durability, while the optimized rubber over-molded comfort grip helps you maintain precision and balance when cutting. It has a 0o-50o bevel capacity, which allows you to make aggressive bevel cuts for a wide variety of applications. The DEWALT DCS391B is powered by lithium-ion batteries (batteries and charger are sold separately) and comes with a 3-year limited warranty. 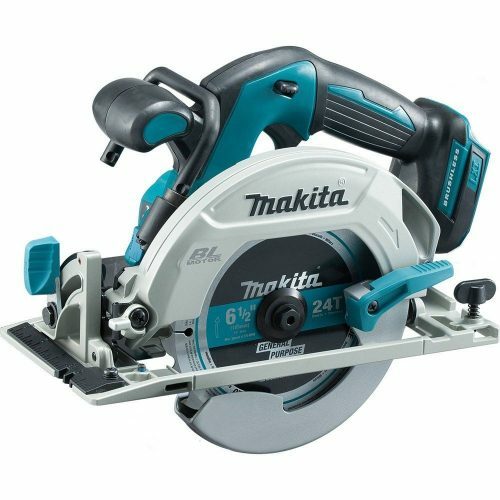 Powered by the 18V LXT lithium-ion slide-style battery (battery and charger are sold separately), the Makita XSH03Z delivers 5,000 RPM via its Makita BL brushless motor for faster cutting and ripping. 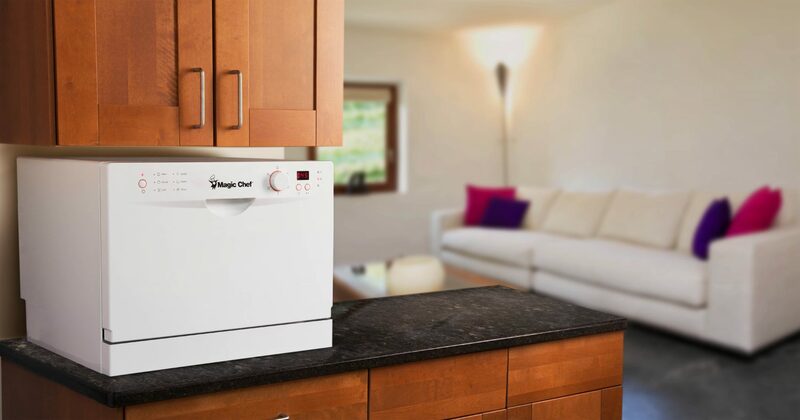 It has also been designed for greater durability and a longer lifespan. It comes equipped with the Automatic Speed Change Technology, which allows you to adjust speed and torque while cutting for optimum performance. The Makita XSH03Z also comes with Extreme Protection Technology, which increases dust and water resistance – thus making it suitable for use in harsh worksite conditions. The Makita 18-Volt lithium-Ion batteries are known for having relatively fast charge times, while the Star Protection Computer Controls allows the tool and battery to exchange data in real time, to help prevent tool damage caused from overloading, over-discharging and overheating. The rapid optimum charger (sold separately) communicates with the battery’s built-in chip while charging, optimizing battery life by proactively controlling current, voltage, and temperature. It also features a built-in fan that cools the battery for faster, more efficient charging. 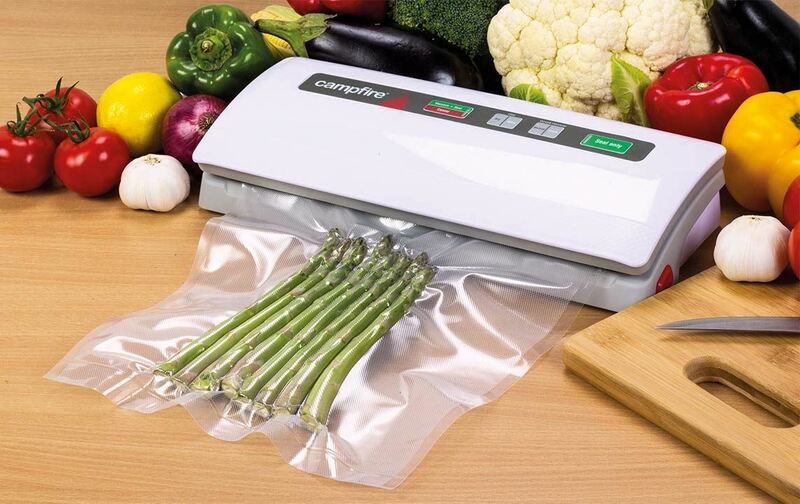 All this additional functionality comes in a compact and ergonomic design (13-3/4 inches long, 7.3 lbs. in weight with battery), allowing you to execute intensive cutting operations without being slowed down by operator fatigue. 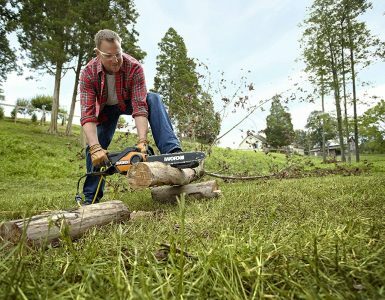 These five circular saws pack plenty of power, functionality, and versatility in compact, user-friendly designs. 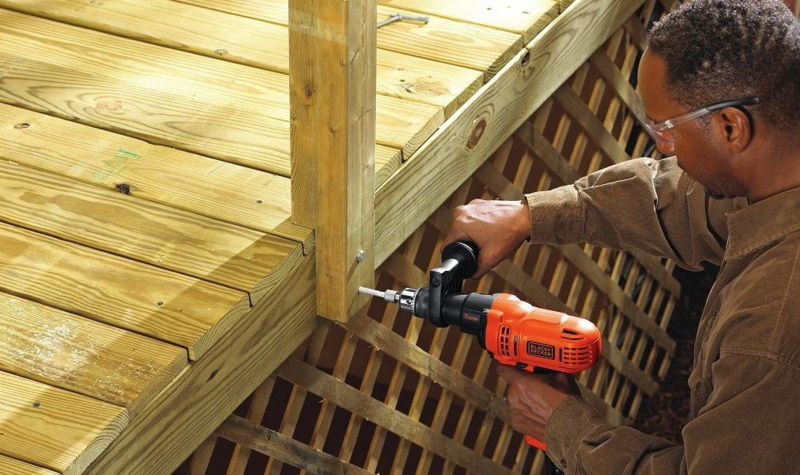 Your choice ultimately depends on the kind of working conditions you operate in (which may require additional features that improve durability or cordless tools for added mobility), as well as the type of materials you need to cut. Circular saws can be dangerous, so do be sure to wear safety glasses when using them, and pay close attention to the safety instructions provided in the user manual. 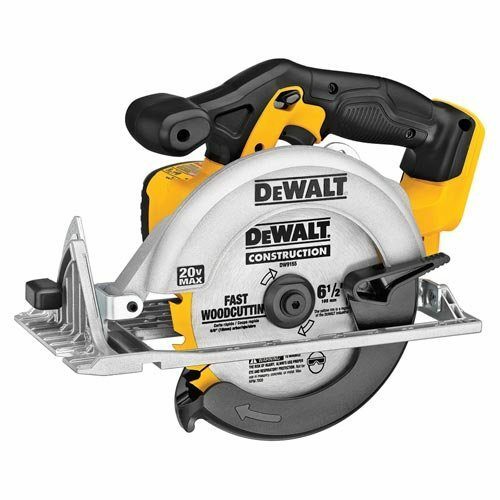 First, before buying the saw, determine what exactly you will be using the saw for. 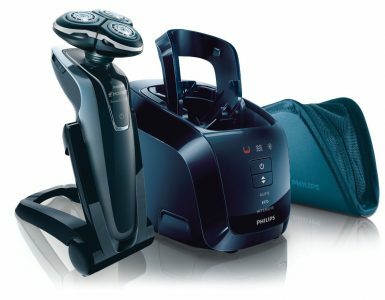 Is it for your work, or only for at home use? 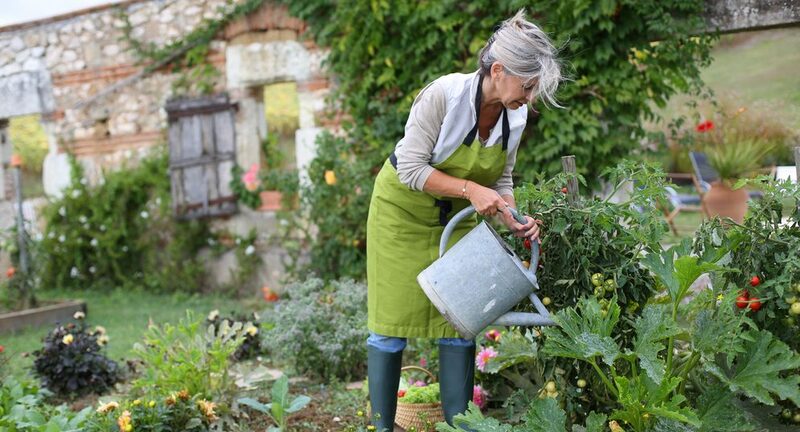 Will you be using the saw frequently throughout the day or just occasionally, like once every couple of months? 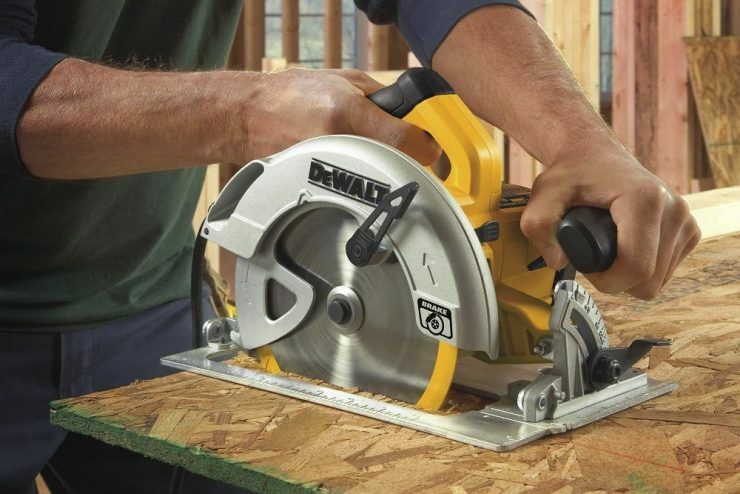 And where will you be using the saw: somewhere where you will have access to power outlets? Blade size- circular saws have a variety of different blade sizes. Choose the blade size you want depending on what type of materials you will be cutting. The most common size is 7 ¾ inches thick. However, there are different sizes for cutting different materials and different thickness. Choose based on what you intend to work on with your saw. Blade type- other than blade size, there are different types of blades as well. You can find different types of blades for cutting wood, the most commonly used one, and blades for cutting wood, tile, and even concrete. The style of the saw- there are two styles of circular saws: worm drive and sidewinders. Worm drive saws have the ability to cut through plywood for extended periods of time. The motor is located parallel to the blade. Since these saws have a lot of power, they are also fairly heavy as well. Also, since the blade is on one side of the handle, these saws give the advantage to right-handed users. Sidewinders are a popular choice on construction sites and amongst homeowners. This saw is much lighter and has slightly less power. The blade is located perpendicular to the blade, which may obstruct the view of some right-handed users. 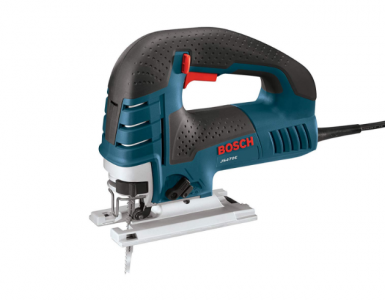 There are also cordless saws, which are very portable, and trim saws, which are much smaller and lighter, and are good for crafts. Power- how much power will you need for your sewing projects? While 15 amp saws are standard, a 10 or 12 amp saw will be better for people who will only be using the saw occasionally. Finally, before buying the saw, make sure to try it out before buying it, so you can get a feel for the saw. Make sure to take the above qualities into consideration before making your purchase. I recommend your tools as one of the best,keep the standard up!